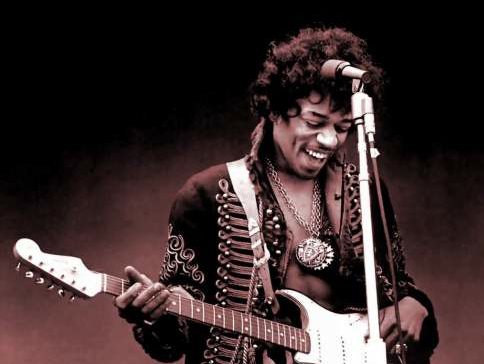 Guitar Blog: Why was Jimi Hendrix such a great guitarist? When I read the Jimi Hendrix biography I realised that his success was largely due to the people he met. When Jimi was young he would take his guitar to concerts and literally go back stage to pick the brain of the guitarist. Some probably even thought he was a little mad I am sure but Jimi knew that the way to become the best was to learn from as many guitar players as possible. Hendrix then went on to play with everyone and anyone of the day but his break came when Rolling Stone's guitarist Keith Richard's girlfriend at the time saw him play. She then introduced Jimi to Chas Chandler who took Jimi to London and introduced him to Eric Clapton amongst others. While Jimi was already a very accomplished player mixing with the top players of the day would have certainly helped to improve his playing. Today we have the Internet and access to an amazing amount of information and resources which I am sure the average teenager would now take for granted. When Jimi was a teen, apart from touring guitar players AM radio (with poor sound quality in mono) was really the only way Jimi could tune in to the latest guitarists of the day. TV for someone like Jimi was probably not an option because they were simply too expensive. Despite all this Jimi used the power of networking to improve. He somehow knew the key to his success was going to be the result of connecting with other guitar players and preferably ones who could teach him something. We are influenced by our environment whether we like it or not. As the saying goes "No man (person) is an island". If you want to be a great guitarists then you need to connect with people who are going to influence you in a positive way. I doubt that Hendrix would have became half the guitarist he did had he just hung around his local neighbourhood in Seattle. Jimi knew he had to go where the guitar players were and that usually meant touring artists and eventually touring himself. The term 'Keeping up with the Jones' is not some out of date throw away from a past era. It is as relevant today as ever. It has been shown that most people will earn pretty much the same money as their friends, have similar levels of fitness and even watch similar TV shows. We are tracking the every move of people around us whether it be conscious or unconscious. It's human nature to follow the group and is the result of evolution. Stay with the group and you are more likely the survive an attack from a predator. Jimi knew that he needed to connect with other musicians to improve and this strategy will also help you. This doesn't mean you only seek out friends who play music and exclude non-musical friends but you want to make sure there is at least one or two people in your life who share your passion for guitar. They don't even have to be guitarists. Just someone who will go to concerts with you and perhaps appreciates the guitar players you listen to. If you don't have someone like this in your life I suggest you start looking. The best place to start is with a guitar teacher because they can connect you with other students as well as introducing you to the places to go and guitar players to check out. Concerts are also a great way to surround yourself with people who share your passion. I think almost every concert I have ever been to in someway has inspired me and I inevitably end up talking to someone I have never met about the music we like. I am certainly not suggesting putting ads for guitar friends on bulletin boards but what I am saying is you should go where people who share your passion go and you will naturally connect with those people who share your passion.